IDEAL Networks has announced its new installation and troubleshooting tester for digital/IP, HD coax and analogue CCTV camera systems, the SecuriTEST IP. With a single tester that can power, configure and document, the SecuriTEST IP aims to increase productivity from start to finish. The tester supplies power to cameras via PoE/PoE+ (Power over Ethernet) or standard 12V DC power using its internal Li-Ion battery, eliminating the need for external power adaptors and injectors. The QuickIP feature allows installers who are new to IP camera systems to quickly and easily connect to cameras without being network experts. The tester can create test reports including video screen shots to verify the job has been completed successfully and reduce unpaid call backs. QuickIP automates the process of connecting to IP cameras, allowing novice technicians to configure IP cameras as easily as analogue cameras. For instances where dynamic IP addresses are required by the camera, SecuriTEST IP has a built-in DHCP server which aims to eliminate the need for additional network hardware. A suite of networking troubleshooting tools is available to pinpoint and solve network connectivity issues. 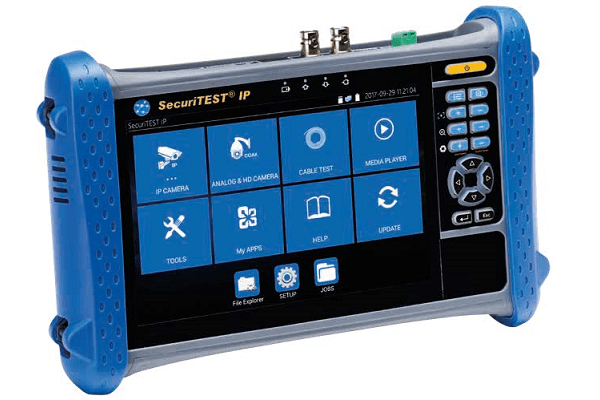 SecuriTEST IP includes the ability to identify and trace cables using the digital tone generator and the Cable Tracer/Remote Tool. Users can choose from four tones and use the Cable Tracer/Remote Tool with variable sensitivity settings to trace either large cable bundles from a distance or pinpoint a single cable within a bundle.